or ask in the forum. This Month 1. What is Wallying ?? – does anyone know? 2. Using GPS in blokart Racing 3. The PRO, what is their job? Why do we need one? 1. Wallying Sounds a bit silly, but this technique hails all the way from the 1987 Americas Cup which was held just up the road from Lake Walyungup in a then little known town called Fremantle. This new strategy helped Dennis Conner’s Stars and Stripes to defeat the previously un-defeatable Plastic Fantastic’s in the Louis Vuitton finals and ultimately go on to win the Americas Cup back from the Aussies. The name wallying came from the attempt by Conner’s crew to hide this technique by referring to it as another crew member “Wally”, they could often be heard saying “Wally says foot off a little” The guts of the technique stems from mathematic probability and the fact that on a windward leg of the course, most sailors sail for VMG, which in itself is a smart strategy as we all know. VMG for those non sailors out there is Velocity Made Good, and is the component of your velocity (heading and speed) that is made upwind, and is relative to the wind direction only, not the course you are sailing on. When you are between the lay lines on a windward leg, you sail for the best VMG so that you can make progress to windward, once you reach the lay line you then sail at the mark. VMG can not be “measured” by a GPS that has a way point at the mark as this will only give you the progress you are making relative to the mark, not relative to the wind direction. The progress to the mark is called VMC, which stands for Velocity Made Course. So if you are between the lay lines, i.e. 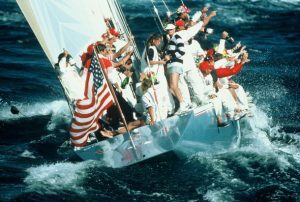 : unable to point straight at the mark, then its always better to sail to have the best VMG right ? Well thats a great strategy to focus on for 99% of the time. Doing this will certainly put you near the pointy end of the fleet if you can do it all the time, BUT, there becomes a mathematical point where even between the lay lines VMC can be increased by not sailing to VMG mode, but by footing off. 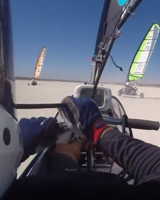 The most common time this is the case is when you are on the left side of the course, on port tack, and you get a big lift… if you are sure the lift won’t last, then the best VMC, is actually to foot through the lift, taking the extra speed, which in a blokart can be as much as 10km/hr faster footing off just 10 degrees. Give it a go, it can be a bit hit and miss until you get the feel for when it works and when it doesn’t. On the big boats there are all sorts of electronics that can help with the decision, but in a blokart its pretty hard to rig up and calibrate a good anemometer so that can determine wind speed and direction, as well as the issue of running a computer with good charting software to give you a VMG vs VMC output. 2. Using GPS on a blokart The 2012 worlds at Ivanpah introduced the blokart world to Velocitek’s Speed Puck, intact Velocitek was a sponsor of that event. Many will remember the Auckland Blokart Club Team arriving with the Speed Pucks on their handle bars, with its massive display. 2014 in Perth stepped it up a notch again with some using speed pucks, some using gamins and other brands, and some using Velocitek’s new Pro Start. Many used the GPS for bragging rights on top speed, but often it was not the top sailors getting the top speeds. If its not about bragging rights or the fastest speed, what are the top sailors using the GPS for? and how does it help them? Lets focus on the Pro Start as used by Paul “Guru” Beckett. This GPS was developed by Velocitek who for years have focused on producing all in one tools for dinghies, sports boats, and skiffs. They have gained a huge following in the international moths, with almost 100% of the fleet of over 150 using one of their products at their 2014 World Champs. The Prostart has two “modes”, pre start and race. 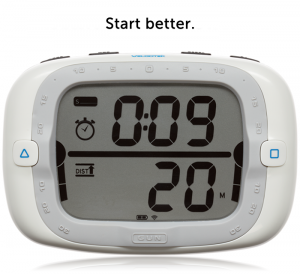 The pre start mode is quite cool in that it gives you a count down timer that can be programmed in 1 minute increments from 1 minute to 15 minutes and also distance to the start line. 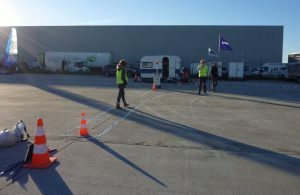 The distance to the start line is programmed by “Pinging” the ends of the startling using the side buttons, but in practice, a blokart is moving quick enough at a venue like Ivanpah that the update rate of the unit just can’t keep up. So the Guru just uses the countdown feature. 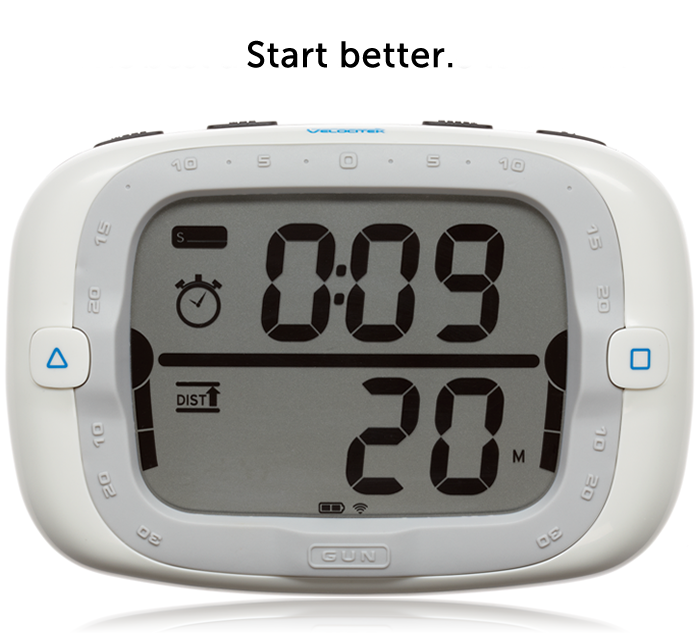 10 seconds after the start gun, the display automatically switches to race mode, where it display’s speed and heading. It also has a graphical lift and knock display across the top. The Guru uses the speed readout to give him some guidance on what is the optimal “target” speed to aim for. Upwind this might be 18knots in a typical 12 to 15knot wind. If the speed goes above 20knots its time to point a little higher, and conversely if the speed dropped to below 15knots he would bear off slightly. This helps the Guru stay within his target zone upwind. The opposite is true downwind too, when gybing downwind to reach the bottom mark, VMG is still important, so the Guru might sail to a target speed of 32knots in 12 to 15knots of wind, if it drops below 30knots, he will head up a bit to build speed, and if it goes about 35knots he will soak down and gain downwind distance. How do you know what your target speed is? Well thats feel and practice. Go out before the race and line up with others to establish what the targets should be. The second feature in race mode is the Heading, this is simply a compass bearing of the direction you are traveling. This can be very useful on large open areas like Ivanpah for determining wind shifts. If you come around the mark on starboard tack and the heading says 245, but last lap it said 255, you know the wind has shifted left 10 degrees. Knowing this may change when you tack and which way you go up wind. Why is all this important? Too many times we see people following the same lines, sailing the same angles lap after lap. This only works if the wind doesn’t shift, and that very very rarely happens. Having a target speed determines the angle you sail, not the heading, the heading only gives you an indication of the wind shift. Sail to your targets no matter what and you will see your results improve… kinda like watching your pennies and the dollars will look after themselves. 3. The PRO’s Job Who is the PRO? What is there job? Why do they cope so much abuse? Are we just shooting the messenger? The Principal Race Office (PRO) is the one standing at the end of the startling who runs the racing for us. Normally this is a volunteer role, and sometimes a sailor who has given up their own racing to help all of us. Their role is to ensure races are run fairly, promptly, and to the instructions they are given by the race committee. They only make decisions based on the directions they are given. Often we see a few complaining about a decision the PRO has made, but when we dig deeper the PRO has simply acted on the instructions given. A notable example is whether or not to start racing; Lets say the wind is shifting around 40 degrees (20 degrees either side of a median wind direction), it is very light, but the wind is building. Do we race? some say yes, some say no, The PRO says no, but they cope a tirade of abuse from the “yes” camp… is it the PRO’s choice… No, they are only acting on the instruction given day’s before by the race committee who have said in that situation to wait until the racing is fair, we are intact shooting the messenger !! Interestingly the “yes” camp often turn into the “its not fair” camp if the races are held !!! The PRO’s daily tasks. Hold the finish flag, and ensure the timing has gone smoothly or the back up system has been used. Clear the course, and repeat as soon as possible to get the most races in. The PRO at the 2010 Worlds – gave up racing to run the races for others. Next Update October 2014 1. Blokart V’s Mini Yachts… one design v’s mixed design, where does the blokart fit? 2. IBRA Update… an update from the September IBRA meeting, who will be the president of IBRA, what is IBRA doing? 3. New Blokart Products, a round up of the 2014 accessories, hub caps, mast protectors etc.